UPDATE: Microsoft has temporarily pulled the 8.1 RT version due to issues some users experienced when installing the update on their tablets and mobile devices. The Start Button Is Back! One of the most hated Windows 8 changes was the missing start button. Windows 8.1 brings it back to the taskbar—tap or click to get to Start. If you prefer, you can now go straight to the desktop when you sign in. And use the same background for both your desktop and Start. Plus, see all your apps at a glance in the new all-apps view. Right +clicking on the Start button brings up a handy menu of power user and system management tools: Event Viewer, Device Manager, File Manager, Control Panel, Run Command, Search, to name a few. Improved Search: Bing Smart Search gives you results from your PC, your apps, and the web. Results are in a clean, graphic view that lets you do things and launch apps right away. Find a song and start playing it, or find a video and watch it right away. SkyDrive,Your Files are Always with You: SkyDrive is free online storage that’s built into Windows 8.1. Save documents, photos and other files to SkyDrive automatically, and get to them anytime, from any of your PCs or devices. You can also use SkyDrive to protect your files if something happens to your PC. And you can use SkyDrive to share and collaborate with others, and see your stuff on mobile and non-Windows devices. Microsoft has made SkyDrive the default place to save new documents, and improved things on the back-end to ensure the system sees them as local files in every way that matters (for searches, etc.). Improved Multitasking: The snap feature is much improved allowing you to resize side-by-side apps to suite your needs. Depending on the size of your screen, you can see up to four apps at once. Automatic App Updates: Windows Apps will now update automatically Updates happen in the background, and the Windows Store will stop bugging you with that ever-increasing count of pending updates. Improved Multi-Monitor Support: Web Designers, Graphic Artists and Photo Editors rejoice! External monitors are a big deal for Windows tablets, since many of them have serious computing power but screens that aren’t exactly what you’d call large. Now in Windows 8.1, users will have more control over how content renders on a second display, giving tablets more flexibility. Native Facebook App: If you upgrade to Windows 8.1, you’ll be able to run the official Facebook app for Windows, which provides a native experience for PCs. 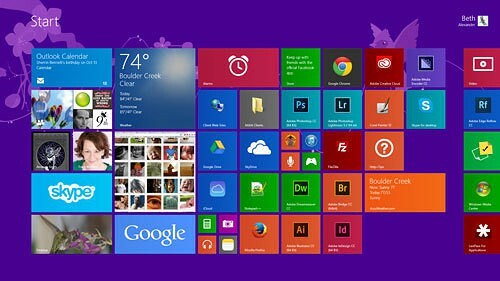 Windows 8.1 was released October 17, 2013. It took about an hour to update my laptop from Windows 8 to 8.1. My computer had trouble reconnecting to my router after the upgrade, but a router reboot solved the issue. Other than that, the upgrade process went smoothly. Learn more about all the new features here.